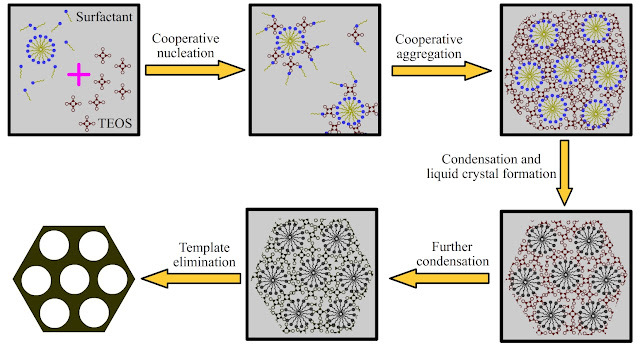 Self-assembly of surfactant (Pluronic F127, P123, etc.) molecules in a solvent leads to the formation of micelles, which are manipulated to interact with selected inorganic molecules/salts (TEOS, sodium metasilicate, etc.). Next, the inorganic species condense resulting in polymer-inorganic mesostructures. Finally, mesoporous silicas can be obtained by removing the polymer through thermal treatment or solvent extraction. This part of research has been focused on exploration of silica sources, such as sodium metasilicate and water glass, which are cheaper than tetraethyl orthosilicate (TEOS) for synthesis of ordered mesoporous silicas (SBA-15 & KIT-6). The research aims to provide additional knowledge for selecting a suitable silica source to prepare SBA-15 with a given mesopore size, pore wall thickness, and complementary porosity.